Puget Sound Kiteboarding Association - Pacific Northwest, Seattle, Tacoma, Bellingham and surrounding areas • View topic - Free Accommodation with Kiteboard Lessons!! Mexico..
Winter is around the corner .. but do you still want to kite?! And do you have a friend/partner that wants to learn now that summer is over?! We are offering free accommodation for people that take 12 hours of lessons. Located in an "up & coming" kite destination in Mexico!! Check out the school, location and wind data on our newly released website. Explore more with a kite!! 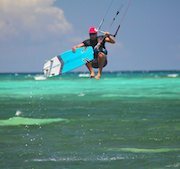 Re: Free Accommodation with Kiteboard Lessons!! Mexico.. So stoked to be able to offer this deal. Free accommodation for 3 night in El Cuyo if one person takes our lesson package.... think about it this way. If you have a friend dying to learn (or a girlfriend) you can come with them and stay for free. The room has two double beds, so you don't have to sleep with your homeboy after a hard day on the water. Anyways, get at us if this sounds like a deal. Warm water....NO WETSUIT and a sh*t ton of things to do when you are too tired to ride. Wind almost every day. Did I mention no wetsuit? I know everybody like La Ventana in the PNW, but I think we found an amazing alternative. Also, some of the best fishing in all of Mexico, plus Mayan Ruins, swimming in Cenotes, SUPing in aping lagoons surrounded by flamingos, soooo much awesome stuff to do! Hit us up for more details and to book a trip. I might also add that John Ruffing and the Curtright family are outright awesome hosts....so come kite with us.